“… Over the years, I’ve been to conferences dedicated to Pinot Noir, Grenache, Syrah, Sangiovese, Cabernet Sauvignon, Grüner Veltliner, Palomino, Riesling and a range of other aromatic grapes, including the dreaded Pinot Grigio, but not Chardonnay. So when I was invited to Ontario to take part in the International Cool Climate Chardonnay Celebration (i4C) recently, I said yes immediately. 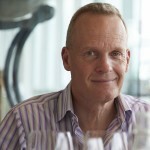 Tim Atkin was the keynote speaker at the fourth annual International Cool Climate Chardonnay Celebration. Read on to discover why he loves Chardonnay and more about his top five picks.